Repair Corrupted PST File & Restore Outlook to PST, Office365, EML, MSG, MBOX, HTML etc. 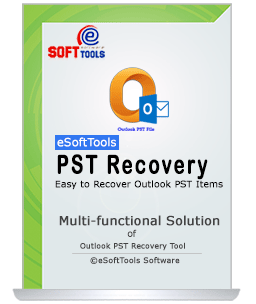 This became too easy to recover corrupted outlook PST file and save again in new PST file with using remarkable eSoftTools Outlook PST Recovery Software that doesn’t requirement the installation of MS Outlook for outlook recovery and restoring outlook PST emails, contacts, calendars, notes, journals and appointments etc. Quickly use MS Outlook file recovery Software against corrupted or damaged PST files and repair PST file without waisting much time and quick to recover outlook file with maintains all folders data truthfulness and emails formatting (to, bcc, cc, time, subjects, attachment and from). 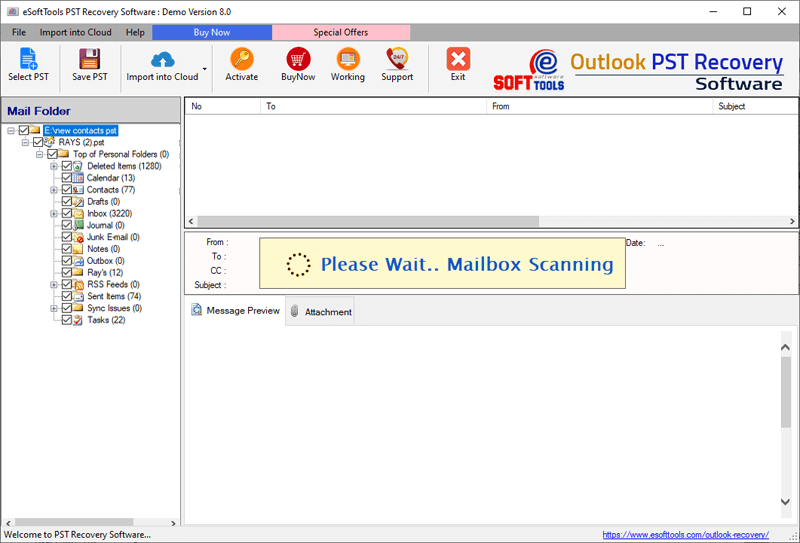 Microsoft Outlook PST Recovery is also known as world best outlook email recovery application that supports deleted folders email recovery in 100% safe zome. Repair highly corrupted outlook PST file easily. Supports ANSI and UNICODE PST file for recovery and conversion. Multiple option to save Outlook PST file like in new PST, Office365, MBOX, EML, MSG, EMLX, vCard and HTML file. Split PST file facilitates to save outlook data into multiple smaller PST files. No Outlook Installation required to repair pst file. Supports Win 10 (32/64-bit) & Outlook 2016 (32/64 bit). 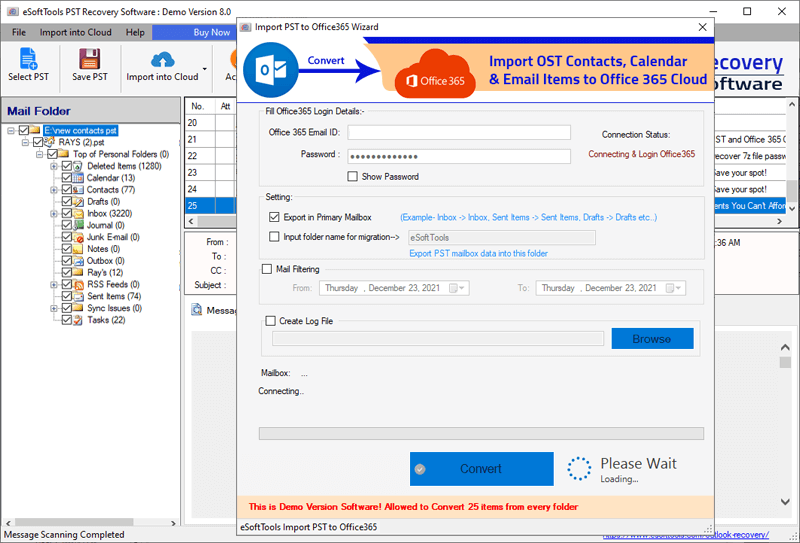 Repair Complete Outlook PST data as like- Calendars, Contacts and Emails etc. Recover password protected outlook PST file as well. Support all versions of MS Outlook PST file including Outlook 2019, 2016 and 2013. Demo version: MS Outlook PST Recovery Software allows to save 50 items from every folders. Outlook Recovery Software has several features that all can be used by users to apply and repair corrupted outlook pst file. MS Outlook PST Repair Software has state-of-the-art technology that offers unpretentious to comprehend steps in front of users which can be humbly followed without putting any extra affords to recover outlook file as well as reinstating Outlook data with emails, contacts, calendars etc. We are providing all greatest and advantageous features of pst recovery software that will help to know about software closely work and save pst file data. The software for MS Outlook PST recovery and conversion, has very unique email recovery engines to start pst file recovery instantly even when Outlook PST file has much bigger in size and recover entire pst file data. This software easy to repair corrupted, damaged and inaccessible outlook pst files and provide multiple saving options. Our PST Recovery tool designed to recover every type of MS Outlook data like Emails, Contacts, Calendar, Notes, Tasks and Journals items. User can recover pst file data into new fresh pst file, Office365, MBOX, EML, EMLX, MSG, HTML vCard and many other formats. 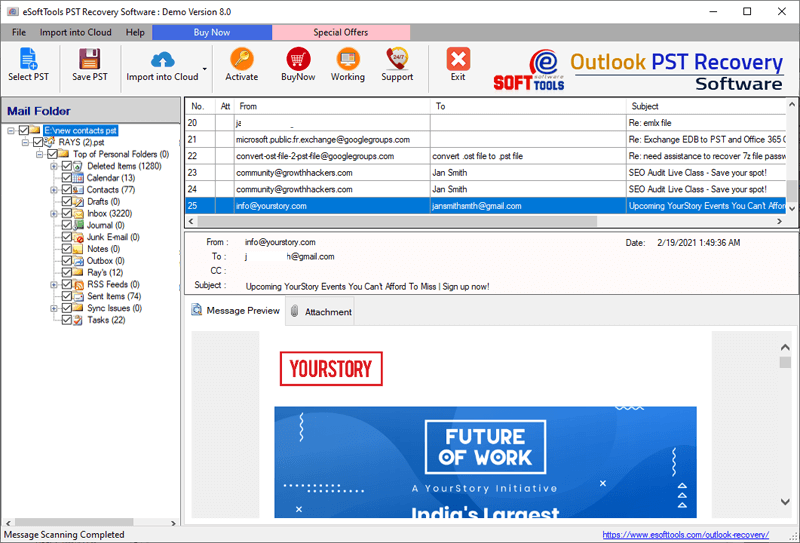 As outlook file scanning process is completed, preview of emails along with other elements recovered is given on the preview panel by Outlook PST Repair Software. This preview helps to guarantee whether the data is really repaired, recovered and convert pst file. User can preview emails, journals, contacts, notes and calendars etc. ; along with their related attributes. In this high-class Outlook recovery Software there is feature of export selective folders or items; all users are legitimate to check or un-check the outlook folders or emails to be exported. The software gives authority you to select the items one by one that need to be repaired or recovered, this feature of the software is helpful in saving the precious time of users. We consider the outlook 2GB size limitation corruption issues that is why we have decided to add free advanced feature of PST File splitting in the software, all users are capable to break the PST file size into Smaller Parts with PST Split option and recover outlook PST File. User can select any size from 1 GB to 5 GB and generate PST file of same size that are easier to manage. Effortlessly repair corrupted PST Outlook file and recover its all repaired items not only into PST file but also in EML, MSG, or HTML format. This will totally depend on you which format you choose for reinstating repaired Outlook file data with emails, contacts, calendars, task, notes etc. The Software will create UNICODE PST file while conversion time that will easily access in MS Outlook. This is not a big issues that your Outlook PST File have got the password because with updated feature of outlook recovery software this is capable to recover data from password protected PST Outlook file along with emails, contacts, calendars, task, notes and appointments with maintains emails properties (to, bcc, cc, time and subjects or attachments). So, use this to solve all problem related to outlook corruption. No matter what version of your Outlook PST File is having, the Outlook Recovery Software has the capability to supports both ANSI and UNICODE PST file for repairing or recovery. It removes all outlook file corruption errors and safely repair corrupted Outlook mailboxes items with successful recovery of their emails attributes without losing any information from PST file. Can I Recover ANSI PST File with using Outlook Recovery Software? What will be format of repaired or Recovered PST File, if I use the Software? If you repair and recover the data into new PST File through this outlook recovery software then the format of PST File will be UNICODE that can be open in all Outlook 2003 and above versions. Do I need to Outlook Installation on my machine to recover PST File? No, you don’t need to install MS Outlook on your machine, without outlook you can repair or recover outlook PST file data. Does PST repair software impose any size limitation for PST file recovery? No, Outlook PST Repair Software doesn’t impose any size limitation for PST file that is why you can repair any size of PST file. Can I recover selective folders from corrupted outlook file using the software? Yes, the software offers to make selection of folders from corrupted outlook file that need to be exported into EML, MSG, HTML or New PST File.